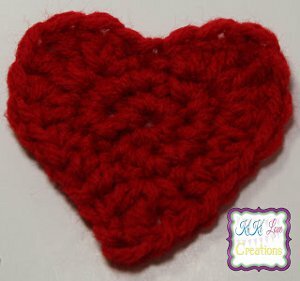 Create one or a hundred crochet hearts with this Hearts Abound Crochet Pattern. These little crocheted hearts look adorable in a garland and can also be used as clever little Valentine's to hand out to friends and family. This is a quick and easy crochet pattern that's great if you're looking for something quick and easy to make. When starting the next round start in the stitch next to the last SL ST for those that apply. 1. Very useful motif 2. What do you mean by "Magic Loop"? Most instructions call it a magic circle. You should be able to find directions here: http://www.youtube.com/watch?v=WLuSVyKvoUg. It's like making a really large, loose slip knot which you tighten after you've done the required number of stitches so you don't end up with a hole. Hope that helps.